In many areas, ever-increasing requirements are being placed on the quality and appearance of surfaces. Particularly with shiny and reflecting surfaces, faultless, high quality production is expected. The parts are often subjected to manual inspection, which can lead to defects being missed due to tiredness of the inspectors. 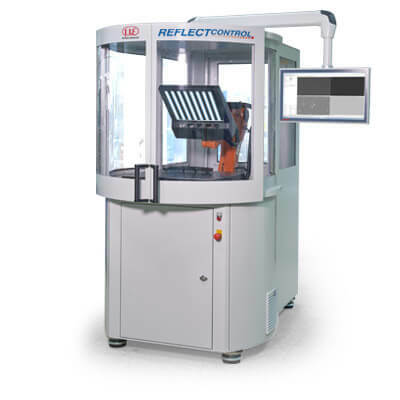 reflectCONTROL is designed specifically to meet the high quality requirements that ensure high quality for shiny surfaces. The system based on deflectometry projects a striped pattern onto the measurement object. Defects on the surface cause deviations from the striped pattern which are recorded by cameras and evaluated by software. reflectCONTROL Compact har utvecklats speciellt för inspektion av blanka ytor. Systemet projicerar ett randigt mönster på mätobjektets yta. Defekter på ytan ger upphov till avvikelser från det projicerade randiga mönstret som registreras av kameror och utvärderas av mjukvara. Det helintegrerade systemet finns i två versioner som ger olika mätfält. 2D versionen används för att hitta defekter på reflekterande ytor. Som tillägg erbjuder 3D versionen mätning av den reflekterande ytan ner på sub mikrometer nivå. Detta system används såväl på laboratorier för test ändamål som i produktionslinorna. 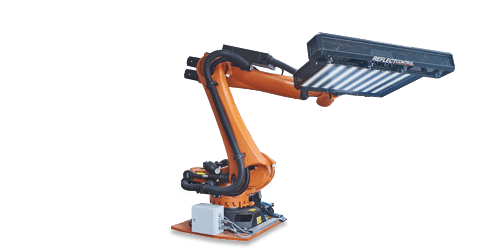 The compact deflectometry sensor is guided over the measurement object by a robot. The sensor enables the inspection of objects whose geometry requires several measuring positions. The defects found are evaluated and displayed in the 3D model.